Wedding planning doesnt need to be all consuming and overwhelming to be right, and if I can help to demystify the wedding dress shopping process then I will do all I can; and that’s why I’m here, helping with the age old… Custom vs Bespoke vs Off the Rack. Custom in this world of mine means having a dress made for you, not a bespoke design, but made for you none the less. This is what your traditional wedding dress boutique shopping will entail. Trying on the gowns in the boutique, finding ‘the one’ and having that dress made for you in the correct size. Now there are a couple of points I would like to stress here, these dresses will not be made to measure unless you pay to have the dress 'made to measure’ this will sometimes be suitable if you have body shape dilemmas, in that your top half is one size and your bottom is another, or you are perhaps taller/shorter than the average bride and therefore need to have the appropriate alterations made to the production of your dress, that wouldn’t be doable in your general alterations with a seamstress; and unless this is standard with the designer you will not have the option of adding sleeves/changing necklines etc this is where your dress will become a bespoke design. Bespoke can be an absolute dream come true for some brides. 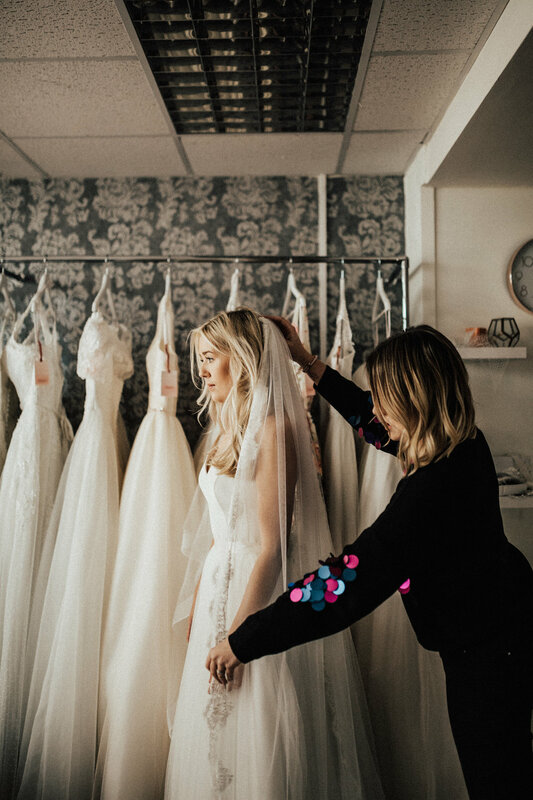 You may have tried on numerous amounts of dresses and not been able to find everything you are looking for in just one gown, this is where your bespoke designs would come in. I am lucky enough to be able to stock several designers that will help create your dream dress for you, so if you love the neckline of one dress, shape of another, design of a third and you want sleeves, this would be your chosen route. Bespoke however is not the road to go down if you struggle making decisions and continually doubt yourself, one you have designed your dress, submitted the order and paid your deposit that dress is yours, so 3 to 4 months later when the dress arrives at the boutique and you now decide that you no longer like that particular lace or wish you’d gone for a blush rather than ivory, then unfortunatly there isn’t a lot that can be done, the dress will have been made bespoke to you and potentially in your measurements not a standard size, so the boutique you bought from would seriously struggle to sell the gown on. Bespoke gowns also carry a much higher price tag than your custom dress, so if you’re finding you don’t have a lot of wiggle room in the budget or maybe you’re short on time, off the rack can be an excellent choice. Pictured above, just some of our House of Mooshki bespoke creations. Off the rack simply means just that, a dress straight off the rails, just like you would at Topshop. So we all know about Wed2B, this is just that, cheaper gowns avaliable off the rail, just like when a boutique has a sample sale. They are selling you a gown at a cheaper price because you are taking that stores sample dress! While obviously the huge advantage of ‘off the rack’ is getting a dress at a sample sale price, it can carry some cons with it to. Chances are if you are shopping at a bridal boutiques sample sale, you will be purchasing an older style gown, the dresses may be in the sale because they have been discontinued by the designer or simply haven’t sold well. You will also find that this is going to be a one size only situation, the boutique won’t be able to order in other sizes for you, so it may well be luck of the draw as to whats available. Some brides have been known to purchase sample gowns in a larger size as to what they need, but this is obviously going to push your alteration charges up, which could sometimes be just as much as what you have saved on the gown! If you’re feeling brave, know what you want and are lucky enough to be close to ‘sample dress’ sizes, they why not hit the sales? I hope that this has helped, and that it is now a little clearer as to what you think you are looking for and what is going to be the best way of finding your dream dress. If you are still struggling and need any help, then by all means, please do get in touch!